Are you looking for a homemade pasta dough recipe? Homemade pasta is relatively easy to prepare with the right ingredients and tools, yet the right homemade pasta dough recipe can elevate your meal from average to amazing. Why Make Homemade Pasta Dough? Homemade pasta doesn't taste anything like the dried pasta you find in grocery store aisles. It has a fresh taste and velvety texture that you just can't get anywhere else but homemade. Certainly you can purchase the fresh pasta that is found in the refrigerated section of most grocery stores, but even that doesn't have quite the same flavor and texture as pasta you will make for yourself. While it seems like it would always be best to use a homemade pasta dough recipe in your cooking, there are some cases where your fresh pasta will shine and others where you might be better off using dried pasta. Homemade pasta is best used in recipes where the sauce you will be using is delicate - such as white sauces, lemon-based sauces, seafood dishes and light marinara. It is also quite delicious in lasagna, where the noodles are large enough that they will stand up to the heartier ingredients it is combined with. In most heartier sauces, the subtlety of the fresh pasta is lost. Dried pasta stands up better to the heartier sauces like Ragu and Bolognese, and it works better than fresh pasta in most casseroles and soups. Most homemade pasta dough is made from three or four simple ingredients. The main ingredients are white flour, eggs and salt, although some recipes will call for olive oil and water, as well. Flavored pastas require different coloring and flavoring ingredients. Many people believe that in order to make homemade pasta dough, a pasta machine - also known as a pasta roller and cutter - is needed. While having a pasta roller and cutter can help to make thinner pasta like angel hair pasta, it isn't necessary. 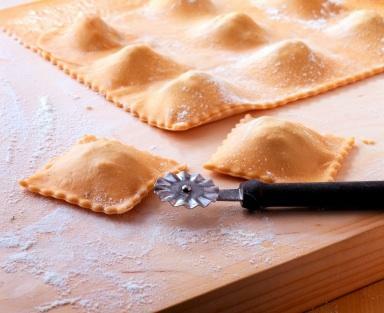 Instead, good homemade pasta can be made using a rolling pin and a pizza cutter or knife. Place the flour in a mound on your silpat or clean work surface. Slightly beat the eggs with the fork. Pour the eggs into the well in the center of the flour. Add the salt to the eggs. Using the fork, begin tossing small amounts of flour into the eggs and blending. Continue to work the flour into the eggs from the outside in until you have a nice, smooth dough. Knead the dough, adding a drop or two of water to the dough or a bit of flour to your surface as needed. Continue kneading for about 15 minutes until the dough is smooth and elastic. Kneading toughens the gluten fibers in the dough, making the dough more easily workable once you begin rolling your pasta. Because of this, err on the side of kneading too much instead of kneading too little. That's all you need to do to make the pasta dough. The next step involves rolling the dough into pasta. Both methods are outlined below. Separate the dough into two parts. Cover one with a damp cloth while you work with the other in order to keep the dough moist. With your floured rolling pin, roll the dough out into a large flat surface. Fold the dough and re-roll, turning or flipping the dough as necessary to prevent sticking. Keep flipping, folding and rolling until your sheet of pasta dough is extremely thin - almost to the point of transparency. Cut your pasta into the desired shape. Repeat steps 3-6 above with the other ball of dough. Separate the pasta into two or three balls. While working with one, keep the others covered with a damp cloth. Set your pasta roller on the first setting (the one that leaves the largest gap in between the rollers). Slightly flatten your dough ball and roll the pasta through the rollers slowly and steadily. Fold the pasta dough in half. Repeat steps two through four above on each setting of the roller, using progressively smaller gap spaces between the rollers. On the final roll, don't fold dough. Hang the pasta sheet across the backs of two chairs to dry slightly while you work with your other balls of dough in the manner described above. Replace the pasta roller on your machine with the pasta cutting attachment of your choice. Working with each sheet of pasta individually, slowly roll the pasta through the cutting attachment to cut your desired shapes. Hang the cut pasta across chair backs or on a pasta hanger. Place a dash of salt in pasta pot full of water. Add the pasta and boil for three to five minutes. Drain the noodles (don't rinse) and toss them with your favorite sauce. It can take practice to learn to make good homemade pasta, but it is well worth the effort.